The features of Dell EMC Unity All-Flash arrays include automated app integration, cloud management, inline data reduction efficiencies, and all-inclusive software for midrange storage simplicity. That’s all well and good, but what do your colleagues have to say about these AFAs? Read on to find out. 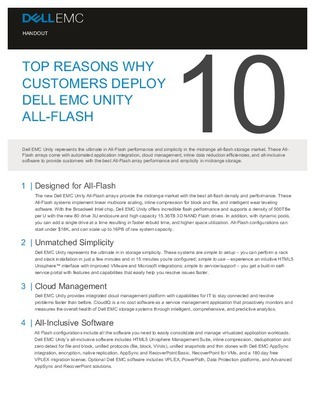 This sheet details the top 10 reasons your colleagues choose to deploy Dell EMC Unity All-Flash arrays.